Dan and Lucas fighting on the balcony. Rachel knocks Ty out then discusses with Susan how to make amends. Nicola worrying about the consequences of her injury from Pete. Karl tries to persuade Pete to have a blood test. Susan catches Nicola and Karl cuddling. Early morning and Susan wakes up to find Rachel sat at the bench deep in thought about what to get Ty. Susan suggests she can still write him a song but ‘just stay away from all the lovey dovey stuff'. Rachel asks what else there is to sing about. Susan says ‘religion, sport...love of country. Rachel: So, something like Australians, Let Us All Rejoice'. Point taken. Rachel thinks something more practical is the way to go ‘like a toaster'. Karl comes out and bids them good morning. He asks if there's any news on Audrey. Susan says Steve wants to see them first thing. He says he has a patient at 8.30. Susan says that's fine, she's organised Toadie to give her a lift. Without looking at Karl, she leaves. Karl senses something's up but has no idea what. Rachel sensed it too. Steve is telling Dan that Lucas is match fit and he's not. Dan says he's got the team working as a unit. Steve points out it's his fault they're a man down, and asks what's going on with him and Lucas. He says Lucas isn't a team player. Just then, the man himself comes in asking who's up for a kickabout. Ty and Ben are, but Steph says they have work to do. Ty protests he's entitled to a lunch break, Steph points out he's her slave. 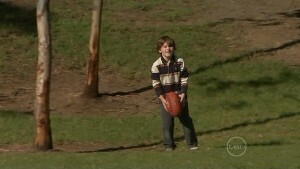 Ben has to beg Libby to let him play football as she's looking for an excuse to avoid Lucas. She finally gives up and Ben asks Dan if he wants to play. He does, despite Steve's protestations. Steph asks if she should call the hospital now or later. LIBBY: If they start acting up in front of Ben, I'll put them in there myself. Libby watches the boys playing. After a while Lucas comes over to chat with her. LUCAS: Loves his football, doesn't he? LIBBY Sure does, shame he's injured. Of course, Lucas was talking about Ben, which Libby says she knew. Dan notices them chatting and starts staring again. Libby tells Lucas that Ben likes him. Lucas agrees he likes Ben. Libby warns him not to use their friendship to spend time with her, which he denies doing. Libby turns back to the game. Lucas says she hasn't been returning his calls. She says she thought it was clear ‘No games, OK?'. She tries to concentrate on the game. Lucas suggests she's not sure whether he's serious or not. She says it's hard to tell. He tells her ‘No games'. She looks at him then looks away so he doesn't notice her smiling. Susan phone goes but she turns it off without answering. Paul comes in and asks her how ‘Jeffrey' is. SUSAN: It's Audrey, Paul, and she'll be fine. He says he's been waiting for her call. She suggests he should leave her alone. He just smiles and raises the job offer. She says she can't talk about that just now. He asks if there's ‘trouble in paradise'. She asks why he thinks it has anything to do with Karl. Paul says he's upset his share of women and recognises the signs. Changing the subject, he says the feedback on the basketball story was good. The Centre's even changed it's mind about banning them, which impresses her. He hands her a new contract with ‘double the original offer' but it only stands if she signs today. She says she has a lot on her plate. Her phone goes off again and this time she turns it off with more force. Paul suggests she channel her anger into something more useful. He leaves and she gives it a moment's thought before reading through the contract. Donna explains to Rachel how she's using her position as a slave owner to help Bridget fix her situation ‘kind of like the Dalai Lhama helping people –only it's about fashion instead of Tibet'. Ty comes in and Rachel watches him buy a drink and leave. Donna says maybe Ty thinks Rachel is more trouble than she's worth, after all ‘crazy chicks are hard work' she jokes but Rachel isn't listening. Dona says he'll forgive her, they're friends after all. RACHEL: Have you ever hit someone on the head with a cricket bat and accused them of stalking? DONNA: Just the once, but she deserved it. Suddenly Donna has an idea, she gets very excited and drags Rachel out of the store telling her she amazes herself with her brilliant ideas. Rachel and Donna are going up in a lift. Rachel says it's a crazy idea and security will be quite heavy ‘to keep people like us away from them'. The lift opens and they go up to a reception desk. Donna gets all dreamy over posters of ‘Fred and Big Tommo'. When the receptionist addresses her, she says she wants them to play a CD she's bought and read out a message. The receptionist agrees to pass it on. Donna tries to explain a bit more about ‘her friend' but the receptionist clearly isn't interested, so she walks off to Rachel who's now sat at some couches. Donna says it's time for Phase Two: ‘where's the fire alarm round here?' Fred, Big Tommo and another guy come out of a door and the girls run up to them. Donna is struck dumb, but they manage to get introductions in. Donna tries to explain what happened with Ty and Rachel but gets distracted by their looks. She begs them to play a song, which they seem happy to do. The girls have now joined Fred and Big Tommo in the studio. I'm not impressed with their DJ patter, but that's by the by. They introduce Donna as ‘The fastest talking schoolgirl in Australia'. Donna explains that Rachel wants to make it up to Ty for ‘going crazy and calling him a stalker and hitting him with a cricket bat'. The boys are rightly shocked by this story. Donna says she needs cheering up after the whole Angus thing. This causes Rachel to glare at her, and the boys to decide to open up the phone lines. Donna asks if she can call a friend. Steph agrees to do something for Donna who's on the phone, and let him know. She turns the bar's music off and the radio on, which annoys Ty. He asks what's on the radio. Steph says ‘You, apparently'. Rachel is getting embarrassed now and wants to leave, but it's too late as they're back on the air. BIG TOMMO: Sounds like you've got yourself in a bit of a tangled web there Rachel, but isn't love always a battlefield? FRED: Thank you Pat Benatar! Big Tommo asks Rachel if she wants to talk a bit more about it. She leans nervously into the mic and declares ‘Umm no, thank you'. The boys and Donna try to encourage her to say a bit more, but she doesn't, leaving ‘dead air' hanging and Steph and Ty confused until the boys fill the gap. Donna protests there's so much more to Rachel's story. Rachel tries to stop her, but Donna blabs that Angus was more than her boyfriend, he was her teacher. Hearing this upsets Ty. During the ad break Donna apologises, saying it just came out. Rachel tells her to keep it in. As the broadcast begins again, Our charming hosts consider whether this subject is too ‘tabloidy' but Tommo reckons they can get a few laughs in it. Ty doesn't look impressed to hear this. Donna gives them the CD and tells them to play track 4 (if you were paying attention, you might notice it's changed from Track 2 earlier, but whatever). Donna announces the musicians are ‘Ty Harper and his band singing ‘Nothin' Doin''. Rachel makes a direct apology to Ty and they play the song. The guys say they did well. Rachel realises they've put the wrong song on. This is her singing ‘Unforgettable'. Steph says that doesn't sound like him. He says it's him and Rachel, not the band. Steph says she's great. Ty nods and smiles. Song continues to play as Lucas and Libby continue to watch Dan and Ben play football. Dan watches them, clearly unhappy. Libby shouts and claps for Ben. Susan cries as the song continues. Nicola cries as the song continues. She watches as Karl consults with someone then dials a number on his mobile, and gets no answer. Lucas, Libby and Ben walk by the rotunda. It's now dark. Ben says it's a shame Dan couldn't stay, which Libby agrees with. Ben says he didn't mean to hurt Dan's shoulder. Libby makes him thank Lucas for buying him an ice cream. Lucas apologises to Libby, but when he hears the ice cream truck he just can't help himself. She says it's fine. She asks him how Dan really hurt his shoulder. Lucas asks what Dan said, but Libby wants to know what Lucas says. She asks if it was a football injury. He says ‘I guess so'. She is surprised that he guesses so, because they're on the same team. He says he didn't see anything. Libby then realises that they were fighting. LUCAS: We're the fighting Fitzgeralds, it's what we do. LIBBY: No, it's stupid and it's childish and I want nothing to do with it. She takes Ben and walks off, leaving him. Paul comes in. Susan says she wanted to see him to tell him she's not signing his contract or working for him. He suggests Karl won't let her. She says it's nothing to do with Karl. Paul asks why then? SUSAN: Well, different ideas about ethics for one. PAUL: That's why I'm here. It's Ying and Yang. It's good for sales and it's good for the paper. And it's probably good for what's left of my family. You're a good person I'm not. Elle sort of sways between good and bad. It wouldn't hurt to have you around to balance things out a bit. SUSAN: You want me to be housemother? PAUL: Apart from writing good articles and generally annoying me, yeah. And don't tell me the money won't come in handy for those expensive vet bills. He then says she must be fed up of just doing housework, then says he realises she needs Karl's permission. She laughs and tells him not to try that one with her. He apologises and says he won't gloat when she signs. As he adopts a smug pose, Susan tells him ‘you're gloating now'. She asks him if he has a pen, and looks over the contract. 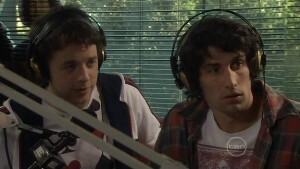 Steph is shocked that Dan and Lucas had a punch up over Libby, who says it's so stupid. Steph is trying not to laugh and Libby forces her to tell her why. She thinks it's ‘hot'. Libby doesn't agree, but Steph thinks having two guys fighting over her is a little bit ‘Bridget Jones'. Libby says she thought it was immature when Declan and Josh were fighting over Bridget, but these are two grown men. Steph obviously still thinks it's great she says ‘I know'. Libby points out ‘it's Neanderthal' which Steph also says ‘I know' to. Donna comes in, followed by Rachel. Steph tells them they rocked. Donna says ‘I was pretty fantastic'. Ty comes over and says ‘hey' Rachel says sorry, it was meant to be a Nothin' Doin' track that got played. Ty says if it helped her singing carreer.... Rachel says it was nothing like that, it was Donna's fault. Donna says there's no need to thank her, but Steph says everyone round there loved it. Rachel again apologises and Ty says there's no problem. ‘One little catch though...because of the plug the band scored two gigs, big money, big crowds'. Rachel asks if he's serious. ‘Provided we have a singer...you'. RACHEL: But I can't, I'm not nearly good enough. TY: Rach, just shut up and say yes. Susan is trying to type something, when there's a knock on the door. She wants them to go away, but they don't so she eventually gets up to answer the door. It's Nicola. She asks if they can talk. Susan tries to say no, but Nicola pleads with her, and Susan lets her in. She tries to ask how Audrey is, but Susan wants her to cut the small talk. Nicola says Susan shouldn't be so hard on Karl. He doesn't deserve to be treated like this. Susan asks if she's seriously coming in and telling her how to relate to her husband. Nicola says no. Susan says after so many years, she thinks she knows her husband. Nicola says she doesn't think she does. Nicola says she's freezing Karl out, which makes Susan mad. They both shout over each other until suddenly Nicola tells Susan she might have ‘a needlestick injury' she might be infected and she's really scared. Susan stops to take this in. Nicola says Karl was comforting her today. He didn't explain because Nicola asked him not to. She asks Susan not to blame him because he has been so good to her. In Karl's office, Nicola has just finished telling him what happened as he says ‘at least dinner will be less tense tonight'. As she is about to leave, Karl notices an envelope on his desk. He asks if Pete refused a blood test, which she agrees. He holds up the envelope and asks her what it is. He looks at her and realises what she's done. She says she had to know ‘if he had it'. He asks how she got a sample and she says he was asleep. Karl says that not only has she infringed patient rights, but what she's done is illegal and could ruin her career. She says what's in there could ruin her life. He says he defended her to everyone. How is it going to look with his name on a test that was specifically refused? Nicola says she'll go crazy if she has to wait 3 months. She pleads with him, saying she has to know. He gives her the envelope. She opens it and he asks what it says. She says it's positive.